Urja Lite Golden Brown Aluminium Wounded Fan Fusion is ideal for people who prefer a stylish ceiling fans with a high durability. The fan has a speed of 350 rpm and power of 70W. This fan is wonderful. Speed is also supper fast.looking very good. Light weight.over all the fan is execlent.I am also rated 5star. 21 of 45 users found this review helpful. Was this review helpful? 12 of 22 users found this review helpful. Was this review helpful? 33 of 48 users found this review helpful. Was this review helpful? 23 of 27 users found this review helpful. Was this review helpful? 2 of 10 users found this review helpful. Was this review helpful? 29 of 31 users found this review helpful. Was this review helpful? 2 of 16 users found this review helpful. Was this review helpful? 1 of 12 users found this review helpful. Was this review helpful? 1 of 5 users found this review helpful. Was this review helpful? 3 of 9 users found this review helpful. Was this review helpful? Got the product delivered on 8th March and commissioned it maybe a week later. In the beginning it really impressed me with its quiet operation and air circulation. But within a month weird noises started, at first very mild and it would go away. Five months hence one night the fan started to grunt and was sure behaving real strange....it has never come on since then. I am hopeful that they would share the number of the Bangalore Service representative. As I wait for the product to be reviewed and rectified. 2 of 7 users found this review helpful. Was this review helpful? 1 of 13 users found this review helpful. Was this review helpful? Good quality product at very reasonable price. 3 of 12 users found this review helpful. Was this review helpful? 0 of 5 users found this review helpful. Was this review helpful? Great Product, Delivery and Exchange in the given time, Fully Satified. Moglix online portal is house of stores with top quality electrical products at marginal price. Original 70w urjalite aluminium fan delivered in very quick time . High quality urjalite golden brown fan. Its hs very smooth oscillationand make minimal noise while rotating. Its really ideal product for indoor and in reasonable price. 2 of 9 users found this review helpful. Was this review helpful? 0 of 7 users found this review helpful. Was this review helpful? 1 of 15 users found this review helpful. Was this review helpful? I just bought 2 of these Urja Lite Golden Brown ceiling fan and installed it myself in my house. The fans look is awesome, well-built, pretty cool air flow and were shipped pretty neatly. I must say you cannot get this type of good ceiling fan in this price range. As per delivery concern, Moglix have improved its delivery time in 2nd shipment. I have bought first fan in june and second in October. So updating my review fith 5 star. 3 of 10 users found this review helpful. Was this review helpful? Last month I order urjalite golden brown fan from moglix store. I was 100% satisfied with their service. I would highly recommend them to a friend, and would certainly use them again. 1 of 6 users found this review helpful. Was this review helpful? Price wise the product is very good and the quality of the product is also very fine, but has little bit noise. 0 of 6 users found this review helpful. Was this review helpful? Made from the best quality of aluminum.The fan has been quality tested by experts and enjoys a high rating from users.1200mm Ceiling Fans Can Be Easily Installed Within Homes Without Facing Too Many Hassles.Urja Lite golden brown fan fusion comes with a frequency of 50 Hz and have a sweep of 1200mm. I was able to do the installation myself. However, I have some observations on the fan - The motor is silent,this is for Energy efficient ceiling fan,This is rather ordinary looking fan, the same technology and the cost reduced ,It does not work with regular regulator which could be a convenient feature. 0 of 3 users found this review helpful. Was this review helpful? I fell in love with the design. simple clean...just perfect. Highly compact and durable fan. Worth of buying. Value of money. 1 of 9 users found this review helpful. Was this review helpful? If you are looking for a designer fan in affordable price, this is the best option, most importantly they are offering warranty of one year. I personally feel good by shopping this fan. 0 of 10 users found this review helpful. Was this review helpful? I have bought this fan on my friend's recommendation. 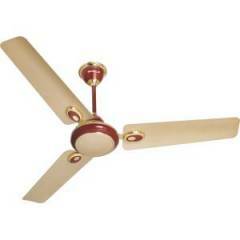 At this price this is good, stylist and value of money ceiling fan. And the interesting thing is this fan comes with 1-year warranty. I'm happy to have this. 4 of 16 users found this review helpful. Was this review helpful?